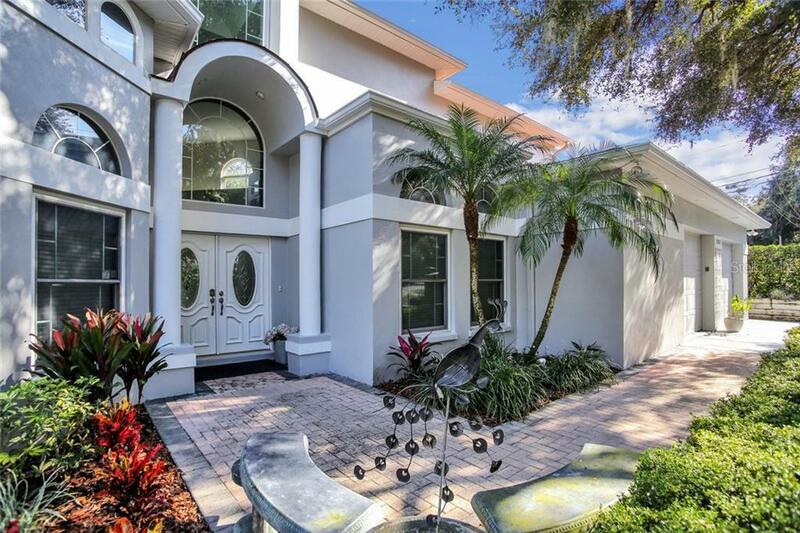 Enjoy living in this gorgeous updated two-story custom-built pool home designed with family, fun, and entertaining in mind. This home offers layers of living area for maximum enjoyment with 5 bedrooms, 4 full baths, and oversized 2 car garage. The architectural design and interior layout creates a comfortable and spectacular living experience for any family. The bright & light 1st level with an open floor plan offers a living & dining room with bar, Kitchen & family room with fireplace, & 4 bedrooms. The spacious owners’ suite on the 1st level features additional seating area with French doors that opens to a beautiful lanai & pool deck. The updated gourmet kitchen features, Quartz counter top, custom cabinetry, a large island, walk-in pantry, breakfast bar & eat-in space in the kitchen with French doors opening to a lovely lanai & pool deck. A focal point connecting this level to the next is a beautiful staircase leading to the 2nd master suite & a loft overlooking the living/dining room. Other features include 22 ft. ceilings, built-ins, security system, wood burning fireplace, hurricane shutters, French doors, new vinyl/cork floors in master & office, newer roof, new fence & much more. The 2 car garage offers lots of additional space for storage. Step outside to a serene tropical lanai with a heated pool & spa, outdoor lighting, and ample space for family fun & entertainment. Enjoy your morning coffee or a glass of wine in the afternoon as you relax in your beautiful spacious backyard oasis. MUST SEE!